Andrija Matić (1978) is a Serbian writer. His novels include A Blackout in Five Images (2013), Manhole (2009), and The Disappearance of Zdenko Kupresanin (2006). His collection of short stories is entitled The Museum of Modern Art (2010). He is also the author of T.S. Eliot: A Poet, Critic, Playwright (2007). Andrija Matić lives in Belgrade, Serbia. Andrija Matić (1978) objavio je romane Pomračenje u pet slika (2013), Šaht (2009) i Nestanak Zdenka Kuprešanina (2006), zbirku priča Muzej savremene umetnosti (2010) i studiju T. S. Eliot: pesnik, kritičar, dramski pisac (2007). Živi u Beogradu. 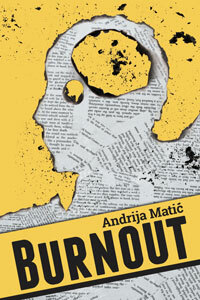 In his latest novel „Burnout“, Andrija Matić draws us slowly, step by step, into the dark inner whirlpool of the protagonist Branimir Rihter, a literature professor at the University of Light in Belgrade. His unhappy marriage, the stifling atmosphere at his university, his unfulfilled artistic ambitions, loneliness, traumas from the past, growing sense of not belonging to the society he is forced to live in – these are the pieces of a puzzle which will lead Rihter to an intellectual and emotional dead end where he will burn up. „Burnout“ is a masterly-written novel about the conflict between a misfit and the devastated reality of Serbian transition, a tragic story of a man who found himself surrounded by the walls on all sides and disappeared in the flame of his own weakness.